Anyone ever experience a feeling of deja vu when reading a comic they've never read before? A feeling that you can almost speak the words on the page you have yet to turn to? I don't mean a sensation that the creators want to draw your attention to as would be the case with a pastiche or rip-off, but an impression that two unrelated stories, characters, or ideas are somehow connected without any intent on the writer's part. Not too long ago over at his excellent post-Crisis Superman review thread, Shaxper detailed the contents of Action Comics 654. 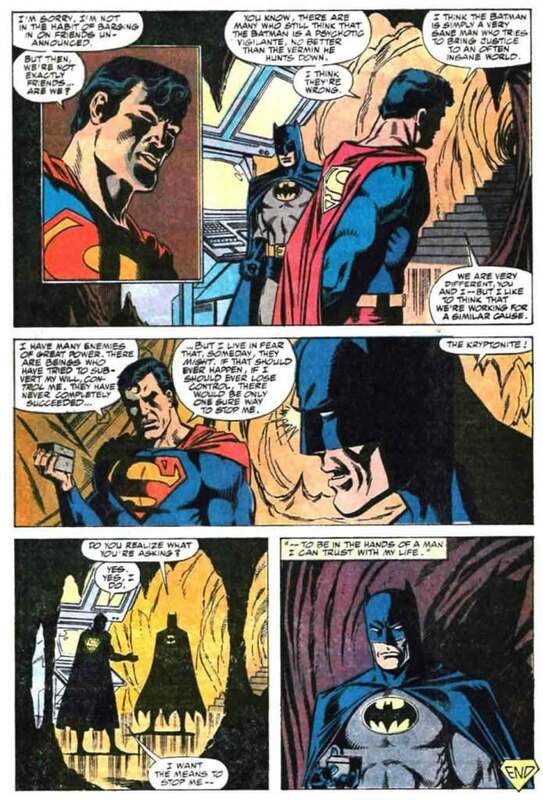 This is the issue which contains the seminal moment when the Man of Steel reveals to Batman his fear that one day, he might lose control of himself and need to be taken down. He presents Batman with Lex Luthor's kryptonite ring and requests that he be the man to stop him if and when the time comes. Interestingly, without even meaning to (I think) Roger Stern paid homage to an earlier issue of Action Comics with this scene. Almost exactly 20 years prior (Action 654 is cover dated June, 1990 whereas the issue I'm about to mention is dated July, 1970) we learn that Superman made a similar request of The President of the United States. I've cut and pasted the following exchange which I originally posted over at Shaxper's thread. Superman is seen reflecting upon a hitherto unrevealed moment from his past. Superman: When I first conceived the SEM - Superman Elimination Machine - it was intended as a last resort safety device to protect Earth from me if ever I went on a rampage! I remember the day I installed it at the White House..."
Cue Flashback at The White House. The President: You have the SEM you briefed me about, Superman? Superman: Yes, Mr. President! If I should ever go mad... run amuck and endanger the Earth... you alone, will be able to destroy me with this! The President: But what is it? You have two Achilles' heels...magic and kryptonite! Which does this use? Superman: Neither! Magic and Green K are weaknesses I've managed to overcome many time! They just aren't reliable enough as Anti-Superman devices! The SEM will be infinitely more deadly to me -- but I can't tell you what it is, Sir - because I don't know! As a final precaution, I used self-hypnosis to make myself forget how and where the SEM came into being! Like I said, I doubt that Roger Stern was thinking about this issue of Action Comics when he wrote his story 20 years down the road. I wouldn't even bet that he's ever read the issue. However, it's entirely safe to assume that if you're writing Superman, one of the thoughts which will likely pop into your head sooner or later is, "Man, Superman sure does get mind controlled a lot!" Once that fact's occurred to you, it's only natural that you start turning ideas over in your head pertaining to whether or not Superman has ever thought about this. Result? Two different writers, coming up with two different stories, which hit some of the same notes as one another. One story therefore isn't a rip off of the other (654 issues of Action? I'm sure there are more than a few with oddly prescient similarities to share between them) but you can definitely see why I would read one and immediately think of the other. Anyone else come across something like? Again, I'm not looking for 'Hey! Supreme is a lot like Superman!' - that's intentional. What I'm interested in coincidences such as the above. I wouldn't bet that Stern wasn't drawing inspiration from the earlier story. He came out of the fan community (the CPL Gang) and was known to reference earlier stories in his Marvel work. 1970 would have been right in his time frame, as he broke into the pro ranks at Charlton, in the 70s, along with guys like Byrne, Staton, Layton and Zeck. Also, DC kept a library of past comics for reference. There are good odds that he would be aware of that story. Now, whether he deliberately wrote the story based on it, was subconsciously influenced by it or it was a complete coincidence, I don't know; you'd have to ask Stern.